So far our discussion has been pretty abstract. We have been introducing you to the art of finance and explaining why understanding it is an essential ingredient of financial intelligence. But who needs financial intelligence, anyway? To put it bluntly, why is this book worth reading? For starters, we want to emphasize that this book is different from other finance books. It doesn’t presuppose any financial knowledge. But neither is it another version of Accounting for Dummies. We will never mention debits and credits. We won’t ever refer to the general ledger or trial balances. This book is about financial intelligence, or, as the subtitle says, what you really need to know about the numbers. It’s written not for would-be accountants but for everyone in human resources. This book is also different from other numbers-oriented books aimed at HR. Those books typically focus on metrics that are specific to human resources, including those related to hiring, staffing, compensation, retention programs, training, and the like. This book, by contrast, is about general financial metrics. These are the numbers that senior managers use to gauge a business’s performance. They are the basis for many of the fundamental decisions a company’s leaders must make day in and day out. Hofmeister believes that HR people should be able to read and understand their company’s income statement, balance sheet, and cash flow statement and that they should be able to “deal with the whole budgeting process, capital investments, depreciation, and so on.” That’s precisely what we propose to teach you in this book. You’ll learn how to read the financial statements and how to use the information they contain to do your job better. You’ll learn how to calculate ratios. You’ll learn about return on investment (ROI) and working capital management, two concepts that you can use to improve your decision-making skills and boost your impact on the organization. You’ll see pretty quickly that it isn’t hard—the concepts are straightforward, the calculations simple. 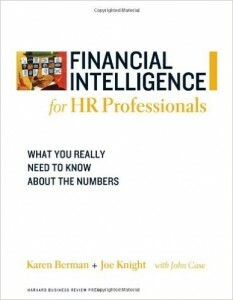 This is an excerpt from Financial Intelligence for HR Managers: A Manager’s Guide to Knowing What the Numbers Really Mean by Karen Berman, Joe Knight, and John Case, published by Harvard Business School Press, 2008. Copyright 2008 Business Literacy Institute. All rights reserved. Get the book from Amazon! Berman and Knight give special attention to cash because managers tend to ignore it. But managers affect cash in many ways, from sales managers who get customers to pay bills on time, to plant managers who order extra equipment just to have it on hand ‘in case,’ to credit managers who give credit too easily or who withhold it too readily. © 2019 Financial Intelligence. All Rights Reserved.